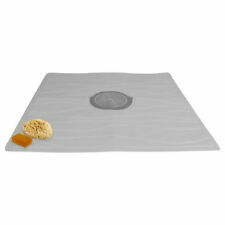 Evelots Non Slip Bath & Shower Mat With Powerful Suction Cups, 22" X 22". It automatically senses hands and dispenses just the right amount of soap. What's more, the system's antibacterial hand soap kills 99.9% of bacteria on hands, so it's ideal for use in the kitchen or bathroom. IKEA Aggersund. IKEA AFJARDEN WHITE THICK BATH TOWELS assorted sizes 100% cotton. Fabric Shower Curtain. adds weight & prevents curtain. White & Navy Blue. elastic sewn into the bottom edge. densely woven fabric. Holds Hot Styling Tools Safely. 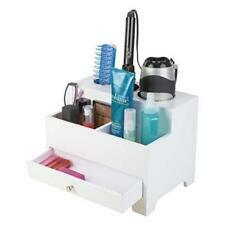 Perfect for organizing your Dryer and Flat Irons and all other hair care. Color: White. Size: 9"H x 12"W x 8.5"D.
Up for sale we have this adorable 2pc set by Bella Lux in a white and gold rhinestones. Included is the soap dish and toothbrush holder. Both pieces are new. These Easy to apply- NOT FOR USE ON TEXTURED SURFACE TUBS and use appliques allow you to attractively decorate your tub and shower floor while providing a great safety feature. Great for children's bathrooms! SlipX Solutions Large Adhesive Traction Mat applies to non-textured surfaces with a powerful adhesive. Simply trim to fit with a ruler and scissors. Once installed, periodic cleaning will help extend the useful life of the mat. Here are two (2) white hand bath towels with the Harley Quinn diamond logo. These super soft towels are a nice bright white color and would look great in any guest or hall bath. Wipe surface with rubbing alcohol to remove any soap/cleanser residue. Press each tread firmly onto surface, working from center outward. Make sure all outer edges firmly attach to surface. Do not touch adhesive or reposition treads during installation. 2017 POLO BY RALPH LAUREN. This towel is Sold Out Elsewhere, and you may not find it anywheres else. Made of 100% Cotton, it has a Plush Red White & Blue Glossy Velour finish on the front and a White Terry Looped Cotton on the back side. ( 5 1/2 feet by about 3 feet) It is 100% cotton and features the Ralph Lauren girl bear in swimsuit attire. A fun look for the beach or pool! New ListingPaisley printed Fabric Shower Curtain in Coral, Spice, Teal and White 72" x 72"
Freshen up your bathroom look and bring elegance to both traditional and modern bathroom decors with this Bold Paisley printed Fabric Shower Curtain in Coral, Spice, Teal and White. -DESIGN: The bold paisley print features a variety of rich hues of Coral, Spice, Teal over White background. The sink sider is easy to refill and can be operated with one hand. Bottles are easily removed for cleaning. That's our challenge! we design, assemble and distribute products from our new York headquarters. Safe-T-Shapes White Daisy Non-Slip Safety Applique Stickers - Bath, Tub & Shower. includes 7 pieces that separate into a large daisy and a small daisy to make a total of 14 appliques. These Easy to apply- NOT FOR USE ON TEXTURED SURFACE TUBS and use appliques allow you to attractively decorate your tub and shower floor while providing a great safety feature. Dispenser tubes are easily cut to fit your containers’ depth. Dispenser Pump (C) has a 4-3/4"L dispenser tube and fits containers up to 6-3/4" deep. Keep yourself snuggly warm after a shower with this white collar robe. The robe is made from 100% cotton to feel soft against your skin and is embroidered with His and Hers monogram for a personalized look. Carnation Home Extra Long Size 100% Cotton Waffle Weave Shower Curtain, white. Waffle Weave 100% Cotton Shower Curtain, Size 72" wide x84 long" in White Our "Waffle Weave" 100% Cotton Shower Curtain will be sure to be a family favorite. With its soft sheen and vibrant colors, the extra long size shower curtain measures 72" wide x 84 " long. Machine washable and does require a shower curtain liner, sold separately. Shown here in white. Durable long lasting design Color: White Machine washable Size: 72"x84" Fashion colors available. Thistletex Windsor Towels Egypt Cotton, Portugal 3 sizes plus Mat Free Shipping! Shark Great White Shark Menace Jaws Shark 100% Cotton Beach Towel 30"X 60"
It's perfect to take on vacation to towel off with after a shower or to use by the pool or at the beach! You could hang it on the wall as a cool accent and it makes a great gift for a shark fan sure to be loved! See photos. Great gift or house warming present. Hotel Quality Waffle Weave Fabric Shower curtain with Metal Grommets 70"x72"
144 Tablet Wash Cloths. Camping and Outdoors. Tablet Size 3/4". Food and Water Supplies. 100% Rayon. Expanded size 9 1/2" x 10". Shelter and Warmth. Each Piece in individually wrapped. 12 Per Package! Self-Adhesive! Applique Bath Mat Rug! The porcelain part of the soap dish is a little more 1" deep an is removable. CYNTHIA ROWLEY. High style and great quality Shabby Chic Ruffle Fabric Shower Curtain by Cynthia Rowley. Add fun flirty style to your bathroom décor with designer Ruffle Shower Curtain. Cascades of overlapping white ruffles, this curtain will add subtle charm to any room. Off-White Jacquard Fabric Shower Curtain: WhiteTrellis Design. 70" x 72"
Give your bathroom a modern look with this Off-White fabric shower curtain. Featuring a woven in large WhiteTrellis design over a Off-White crushed jacquard background. The Crushed Jacquard shower curtain gives a feeling of luxury and will hang easily on 12 button stitch openings. Carnation Home "Lauren" Double Swag Shower Curtain, White "Lauren" double swag dobby fabric shower curtain, 100% polyester, size 70"x72", color white Our "Lauren" Diamond-Piqued Double Swag Shower Curtain with attached ruffled valance, two tie backs and peva liner will not only bring a touch of sophistication to your bathroom, it will also provide a wealth of opportunities in which to coordinate. This standard-sized (70'' wide x 72'' long) curtain is 100% polyester, machine washable, and water resistant. Here in a solid White, "Lauren" comes in a variety of stylish colors to fit your particular needs. Also available separately are the matching "Lauren" window curtain and sink drape, taking some of the guesswork out of accessorizing. NANTUCKET BUNNY SOAP DISH –NWT – WASH YOUR HANDS OF BLAH BATHROOM DÉCOR! Make a clean break from your bathroom décor with this hard-to-find Bunny Soap Dish from Nantucket. Wonderfully crafted of ceramic, the egg-shaped Soap Dish features ornate, embossed patterns along with three adorable bunnies clambering on from the edges. Lotion/Soap Dispenser and Toothbrush Holder. BELLA LUX TWO PIECE BATHROOM SET. White Crystal Rhinestones adorned. Terrycloth and is machine washable. Bath, hand towel and face cloth. Beautiful Realtree quality All Purpose camo towel set is perfect for. anyone who loves the camouflage used by deer hunters and the. Fashion black and white tree pattern bathroom curtain waterproof mildew thickening shower curtain hanging curtain curtain 180CM 180CM. • 86/14 or 88/12 blended cotton for softness. • 25 dozen (300pcs) White washcloths. OUR SNOW WHITE SALON COLLECTION TOWELS ARE MADE FROM THE FINEST BLENDED COTTON FOR SOFTNESS AND HIGH ABSORPTION. • Weight 1 lbs per dozen.